Besides integrating systems and making data accessible to knowledge workers, Ometa is also able to bring knowledge workers together in order to collaborate based on specific events. Business processes usually pass several states where different knowledge workers each have their own task to guide the process in the right direction. Wherever decisions have to be made to continue the process, information must be shared or processed. This involves both structured and unstructured data. The strength of Ometa is that we can gather people to work together on specific cases. Dynamic case management (DCM) is a working method that is based on cases. Therefore, this approach requires a specific functional setup in which cases are provided with different life cycle states. Usually these states are defined in back-end systems such as an ERP. For example, when we look at projects, we can recognize states such as initiation, definition, execution and delivery. Depending on the project state, the functionalities or the structure of user rights might change. In the Ometa framework, state transitions can be modelled and it is possible to configure the functionalities and user rights for each different state. Based on specific triggers or events (e.g. a material requirement, an expiring contract, a sickness report or a subsidy application), the state will change and several people will be involved to work on the initiated process in the form of a case. Depending on the state of the case, a specific department or a specific knowledge worker is invited to complete his or her task only at the time when this becomes relevant. This method is repeated until the process is fully completed. This then means that the case is closed. You can record the cause or trigger that initiates the collaboration once only with the Ometa modeler. From this point forward, the whole collaboration process will be automated. Depending on the state, the functionalities or the structure of user rights can also change. The state changes can be modeled in the Ometa framework and it is possible to configure the functionalities and user rights for any other state. A specific characteristic of DCM, is that the state of the object in the ERP (e.g. project, supplier, employee, etc.) is taken into account in order to decide who gets access and which information is shown. This means the whole integration is dynamically dependent on the state of the process in the ERP. The great advantage of event based collaboration is that we only push the relevant information to the right people and only at the time when they need it. 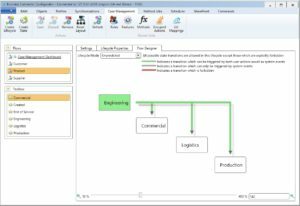 The DCM functionality orchestrates and automates the information flow within the organization or across the chain. 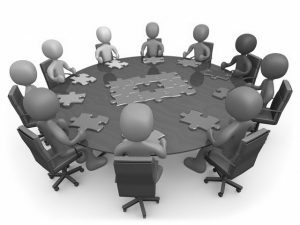 In this way, we ensure that organizations can collaborate efficiently both internally as well as with external parties.